Erin Adams, a Beaumont School senior, represented Beaumont at the 9th annual Girls Division II State Golf Tournament. Adams finished 11th out of 71 girls who made the trip to Columbus, to play in the Oct. 14 and 15 championship at The Ohio State University Gray Golf Course. Adams previously competed in the 2013 state championship, for which Beaumont’s team qualified. This year, she came out strong on day one, and shot a 4 over par 74. She followed up with an 87 on day two, for an overall score of 161. 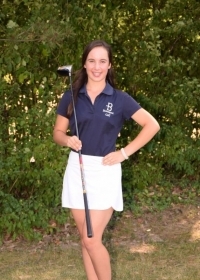 Adams has been a member of Beaumont's golf team throughout her high school career and, as a senior, has become a leader both on and off the golf course. She is helpful, encouraging and always there for her teammates. "As one of the co-captains this year, Erin has really stepped up in the leadership role,” said Coach Katie Kirk. "When you have a team that has a lot of freshmen about to start school, Erin was right there to help tell the girls what to expect in classes, and on the golf course. Erin is always there waiting until the last girl comes in from [her] round, giving words of encouragement. Even if Erin didn't shoot her best round, she would always have a positive attitude toward the other girls." In addition to being an avid golfer, Adams is a top-notch student, is involved in competitive Irish dance, and is a member of the Beaumont track team, among other extracurricular activities. Rick Haase is director of public relations and marketing at Beaumont School, a Catholic school in the Ursuline tradition, educating women for life, leadership and service.